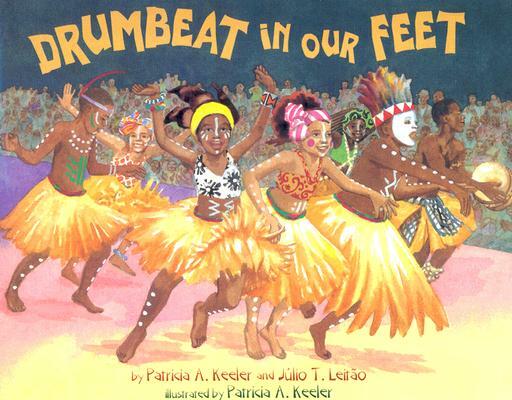 Drumbeat in Our Feet by Patricia A. Keeler and Julio T. Leitao. Grades 1-5. Lee & Low, 2006. Unpaged. Review copy provided by my local library. Paint diamonds on arms. Paint lines on faces. Think about the ancestors and ask them to guide the performance. Drums. Xylophone. Feel the beat. Dance! Drumbeat in Our Feet takes the reader along with a troupe of children learning African dance, from the rehearsals to learning the meaning behind the dances, to the performance day. As illustrations show children doing each step, sidebars provide information about the history and traditions of African dance. This colorful book would make a great addition to units on Africa or performance arts. Also, make sure you keep it in mind during Black History Month! The book first talks about how diverse Africa is, from grasslands and deserts to dense forests and beaches. It says, "The history of African music and dance is as rich and diverse as the land itself." The accompanying illustration shows American children coming together from many different neighborhoods to attend African dance class. Throughout the book, we learn that dances have been passed down over many, many years and that it's important to keep these traditions alive. The lyrical text provides information in an accessible way, while the illustrations do a nice job of showing how African traditions are kept alive through modern dance studios and teachers. At the end of the book is a section with photographs and information about Batoto Yetu, a renowned children's dance troupe that performs African dance. Back matter includes a simple map of Africa, a pronunciation guide, and a list of sources. 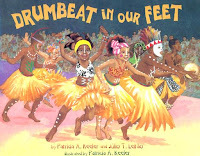 Drumbeat in Our Feet is a great book for discussing the importance of keeping cultural traditions alive. It would make a wonderful resource for a group about to attend an African dance performance and it is a wonderful read for anyone wishing to learn about African culture. Many thanks to Andrea who recommended this book to me! Happy Nonfiction Monday! Diane at Practically Paradise has this week's roundup!